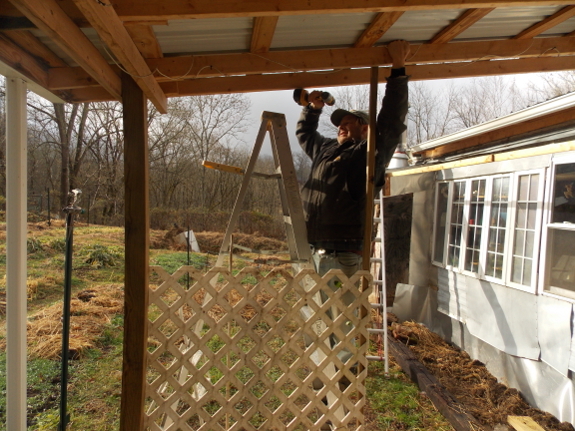 Off and on, as the spirit moves me (and weather permits), I've been working on the south side of the trailer's living shade project. It's been too cold and wet to fix the gutter, but I snuck out on Monday and put up some trellises for a hardy kiwi and grape that I hope will shade the porch in future summers. I couldn't quite decide whether to put the trellises down low, in the middle, or up high, so I went for the easy solution (low). 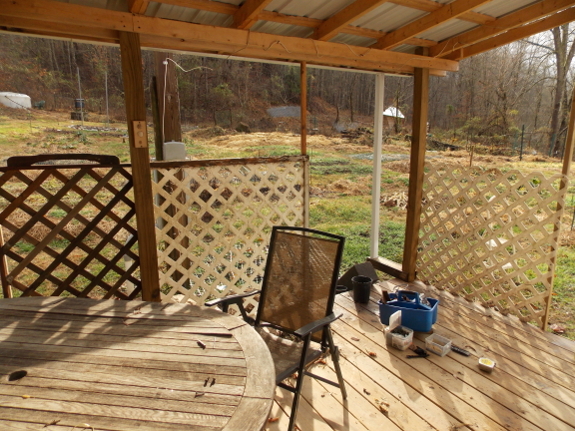 Depending on how much the porch roof shades the vines, I may add some wires higher up to complete the vine supports. I say "I did this" and "I did that," but the truth is that Mark helped me with the highest attachment point. Thanks, honey! Hopefully we'll both reap the rewards when we have a shadier porch come summer. You will enjoy the shade and the fruits of your hard work.